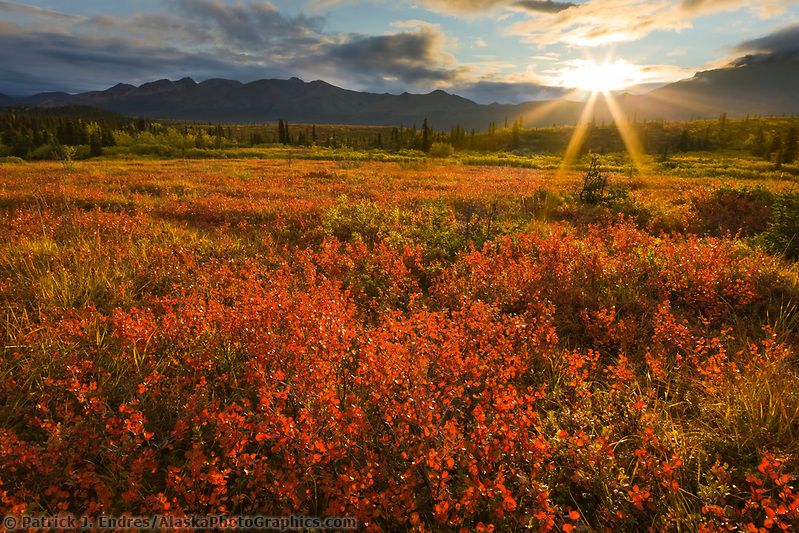 Denali National Park photos - links to wildlife and nature picture galleries. 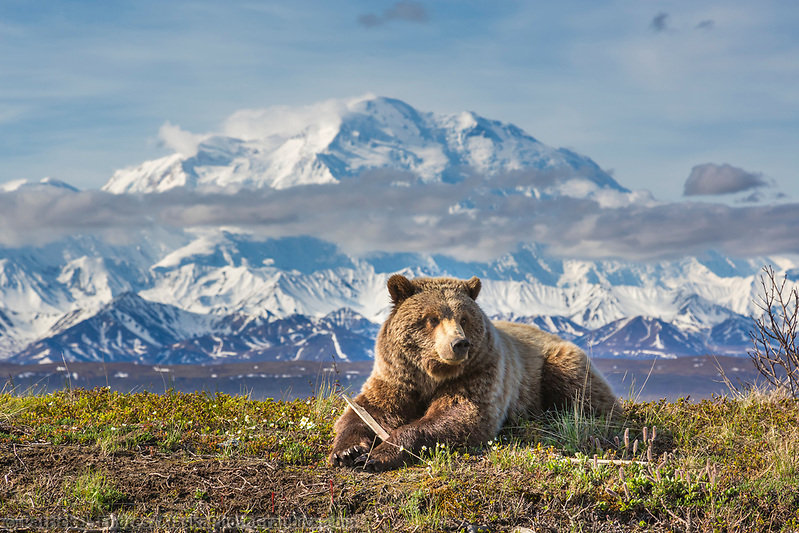 I first set foot in Denali National Park in September of 1981, although unskilled in camping and wilderness travel, that experienced uncorked my desire for wild places, and flamed my already growing desire for photography. 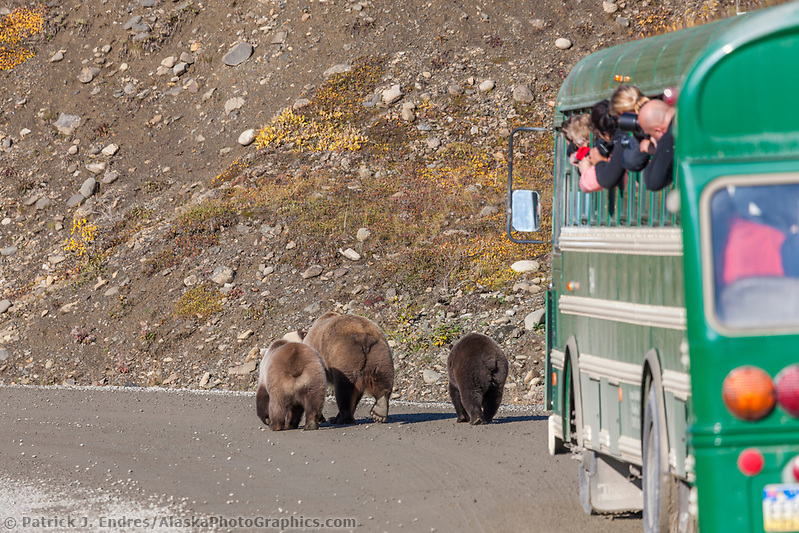 Since then, I’ve traveled and photographed Denali Park on foot, bicycle, bus, plane, skis, and car. 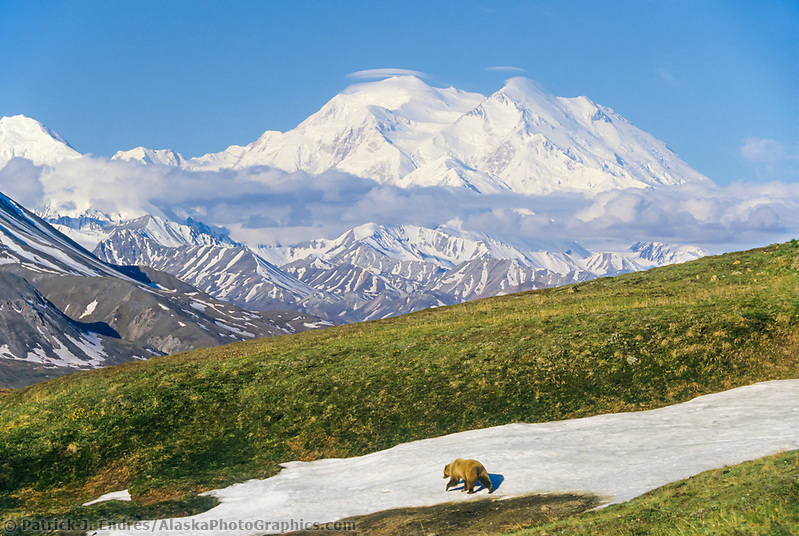 My photo archives include thousands of pictures from Denali, in nearly all categories. 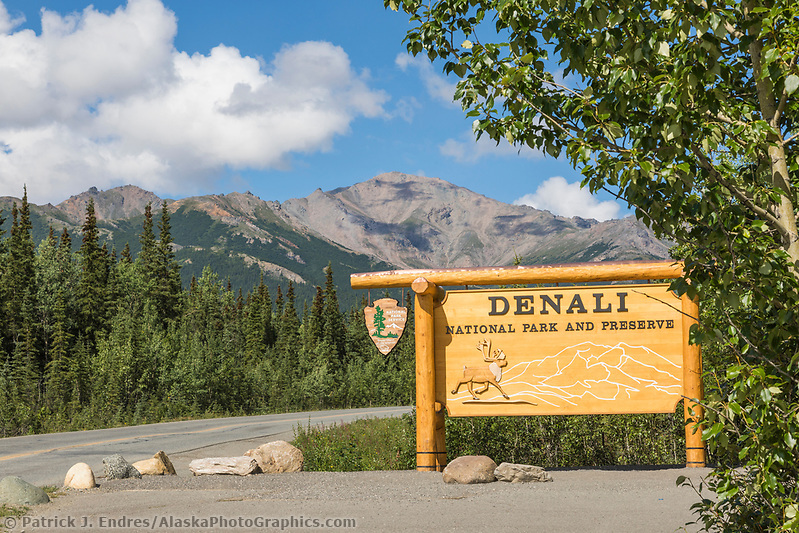 All of the Denali National Park photos on this site are available to license as stock photos or for purchase as fine art prints for your home or office decor. Click on the respective photos or links for purchasing and licensing options. Additional photos can be found through the keyword search top right or the galleries to the left. Denali National Park and Preserve is one of the world’s most scenic and wildlife-rich national parks in the nation, if not the world. 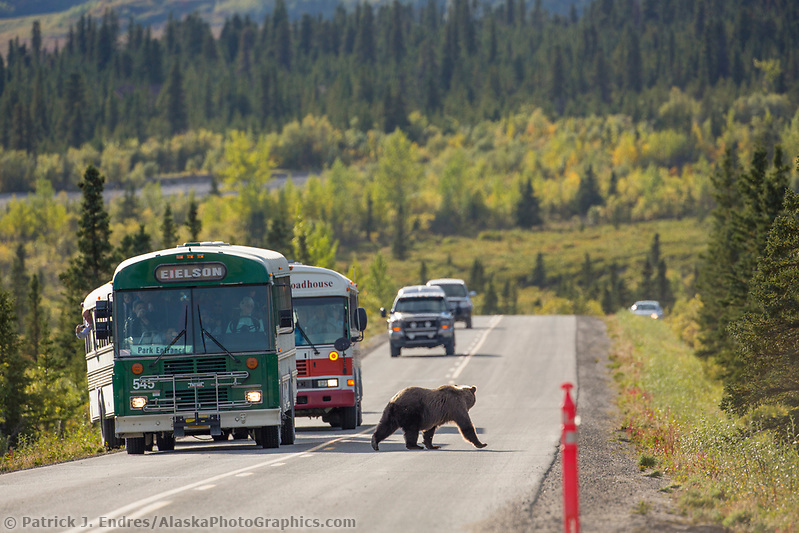 This is also the reason it is one of the most highly visited parks in Alaska. 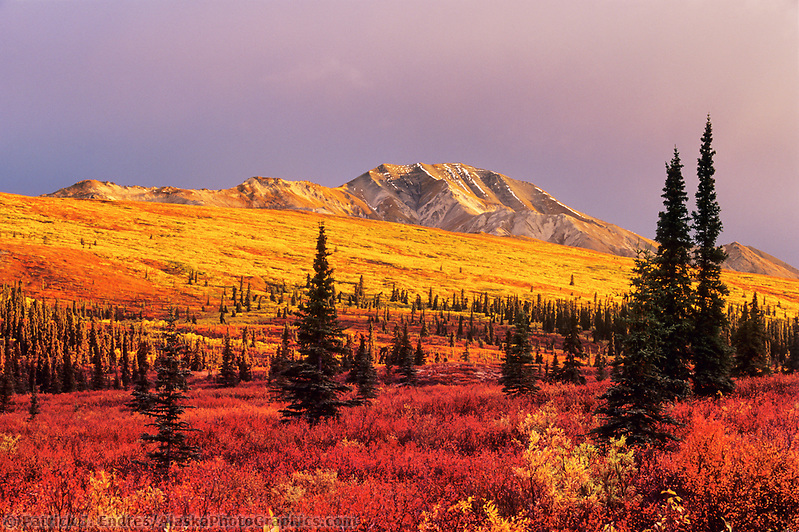 Situated in the heart of the Alaska Range, the park’s mountain weather is dynamic and constantly changing, creating a dream theater of light and drama. The 6 million acre park, larger than the state of Massachusettes, has only one narrow and windy road that penetrates 90 miles into the park on the north side of the Alaska Range. Beginning at 1,585ft, the small road crosses four mountain passes—the highest at 3,900 ft. (3600m). 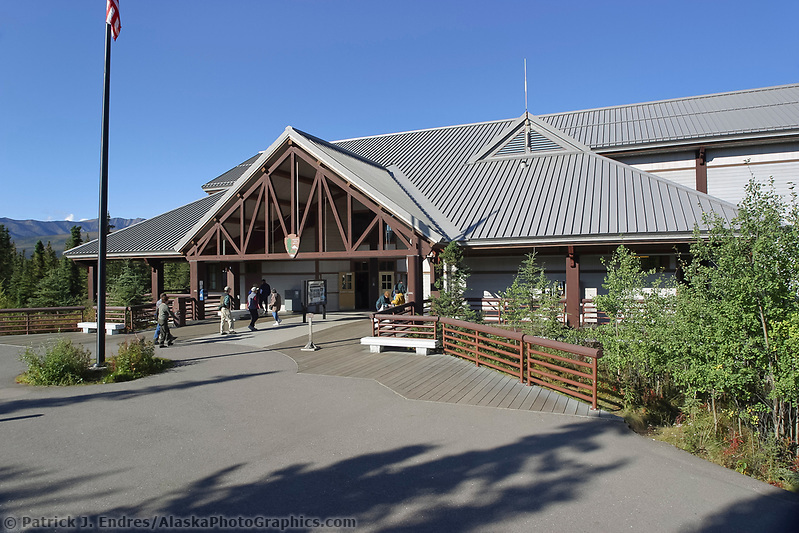 The Park entrance is located at mile 237 of the George Parks Highway, a 4-5 hour drive from Anchorage and 2.5-hour drive from Fairbanks. Once at the park entrance, it is a short 1.5-mile drive to the Visitor’s Access Center where campground reservations and bus tickets can be purchased. An organized shuttle bus system takes visitors into the park beginning in late May or early June, ending in mid-September. 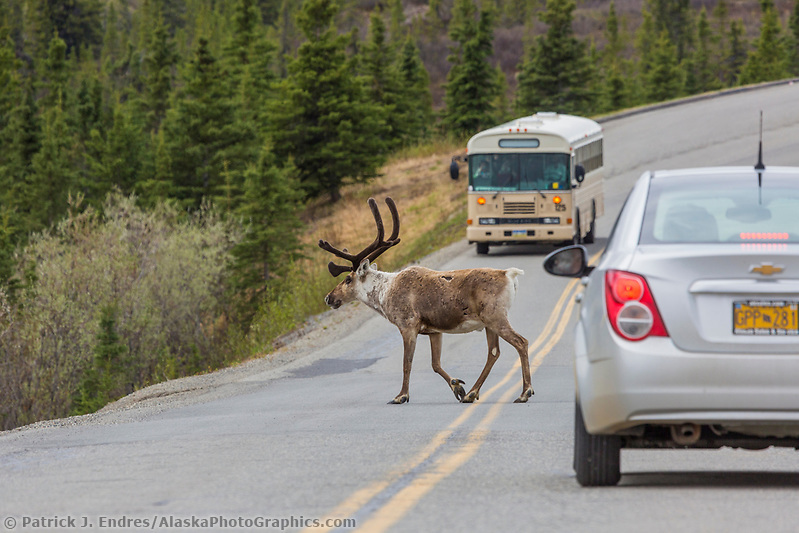 While the park is technically open all year to non-motorized traffic, limited access via the Denali Park Road in a personal vehicle is available in May and late September depending on when the snow melts in spring and arrives in late autumn. The first 15 miles are paved and accessible by public vehicles, but only park buses or vehicles with special permits may travel beyond the gate at Savage River, where the road turns to gravel. After the continental glaciers retreated some 14,000 years ago, new soils emerged to support the slow process of re-vegetation. Deep frozen ground called permafrost still underlies much of the land and just a thin layer of topsoil thaws each summer to support life. 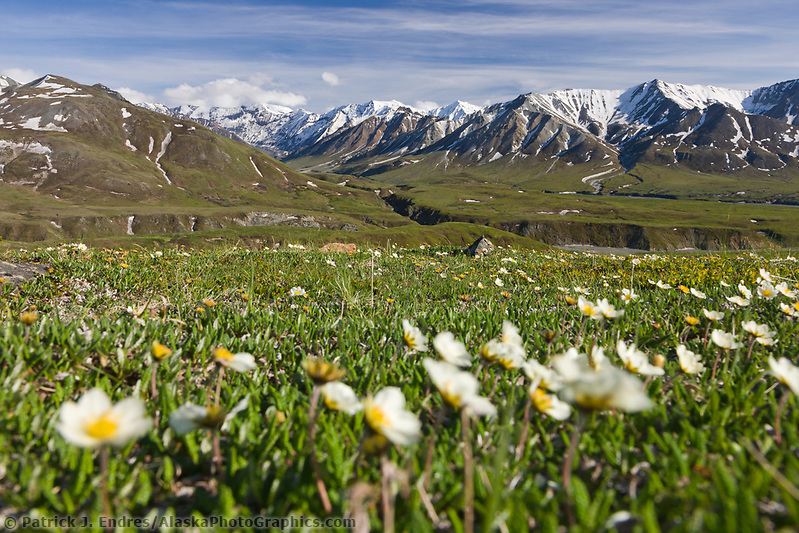 The tundra hosts a diverse world of dwarfed shrubs and tiny wildflowers adapted to survive the short growing season of the harsh subarctic wilderness. 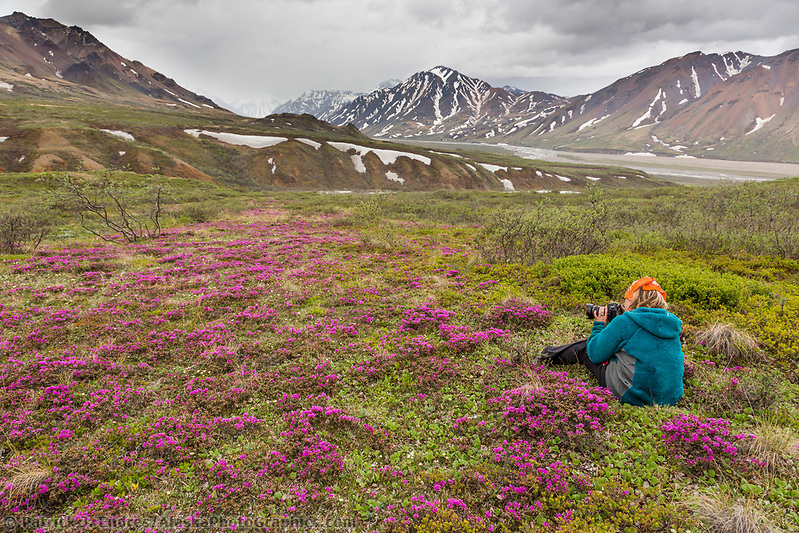 More than 650 species of flowering plants, as well as many species of mosses, lichens, fungi, algae, and others, adorn the slopes and valleys of Denali. The tiny highland plants grow snug to the ground, creating their own livable microclimate. Mountain avens, dwarf fireweed, moss campion, Lapland rosebay, and forget-me-not (Alaska’s state flower) make stunning summer displays of delicate blossoms. 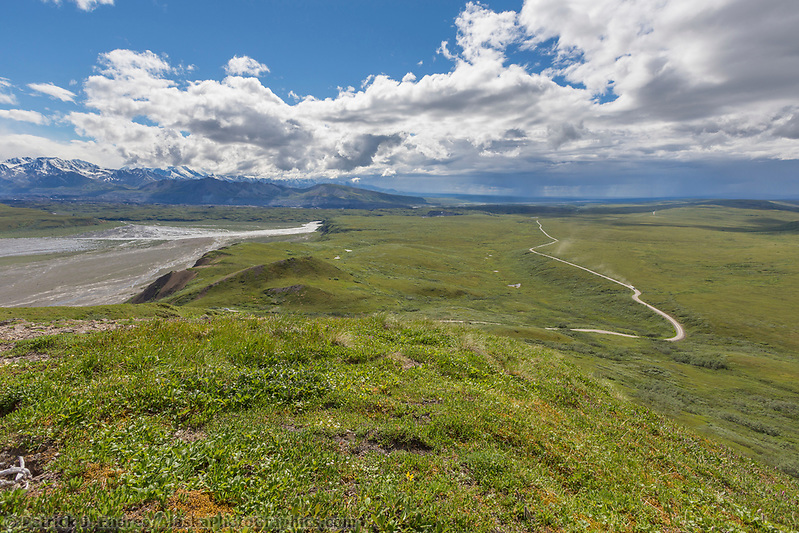 Denali’s lowlands and slopes consist of taiga and tundra. 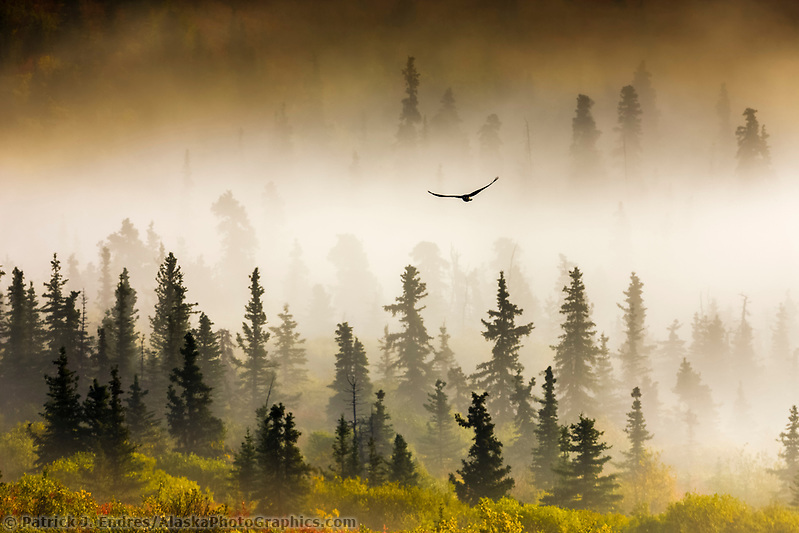 Taiga is a Russian word for the sparse northern evergreen forest. The dominant white and black spruce trees are interspersed with quaking aspen, paper birch, larch, and balsam poplar. Many open areas are filled with shrubs such as dwarf birch, blueberry, and a variety of willow species. The tree line occurs at about 2,700 feet. Tussocks, sedge, cotton grass, dwarf willows, and alders give way to abundant wildflower meadows above the shrub-line. Eventually, the plant cover thins to scattered patches amidst barren rock the at 6000-7000 ft.
Denali Park hosts some of the densest grizzly bear habitat per square mile in the world. That is part of the lure and attraction to this great alpine tundra region—to see a grizzly bear in the wild. 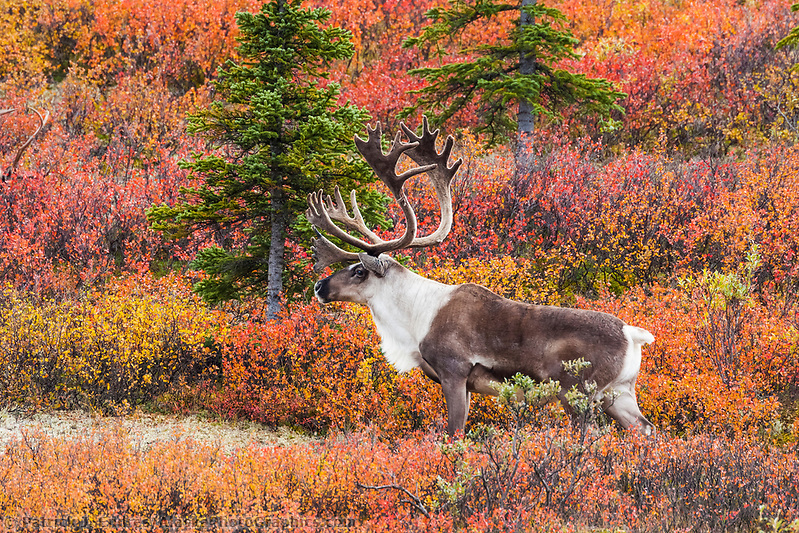 It is also home to many other animals including some of the larger, more icon species including caribou, moose, Dall sheep, wolves and a host of smaller animals. 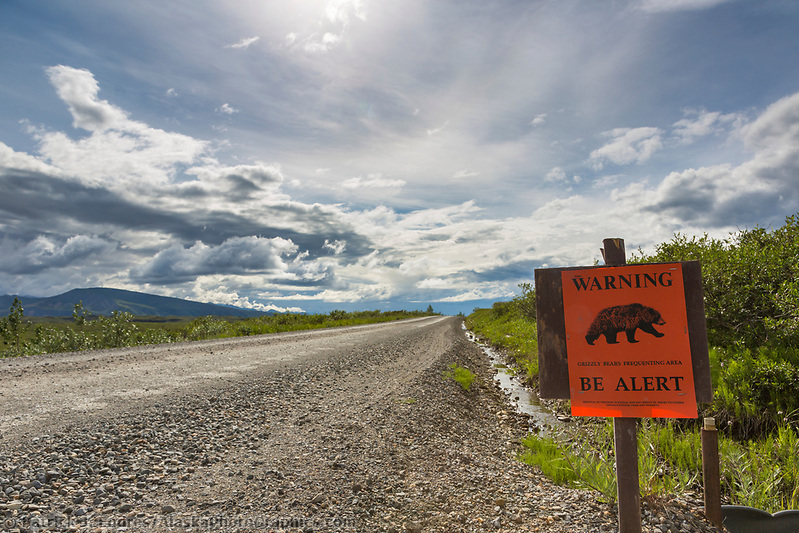 Denali Park has a bear safety orientation that is required for backcountry travelers. Spring, summer, and fall provide a compressed respite from the sub-Arctic long season of deep cold. For most animals, it is a busy time during which they must garner most of their annual food supplies. 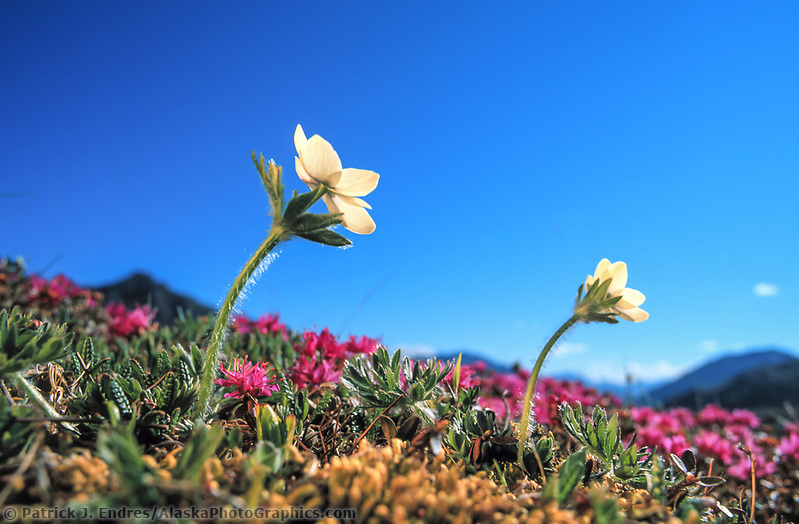 Dall sheep, relatives of the bighorn sheep, graze the alpine tundra for the young shoots of mountain avens. Ewes and rams live apart in summer, while the lambs are getting their start. Caribou travel in groups. Both sexes have antlers, the only deer family members to do so. Caribou migrate great distances from their calving grounds south of the Alaska Range and northwest of Denali to their winter range in the northern reaches of the park and preserve. The Denali Herd has fluctuated greatly in number over the last 30 years. Today groups of 20 or more may be seen from the park road, quite different from the thousands seen many years ago. Moose are commonly viewed with densities increasing around the forested regions of the park. This includes the areas near the park entrance and Wonder Lake area. 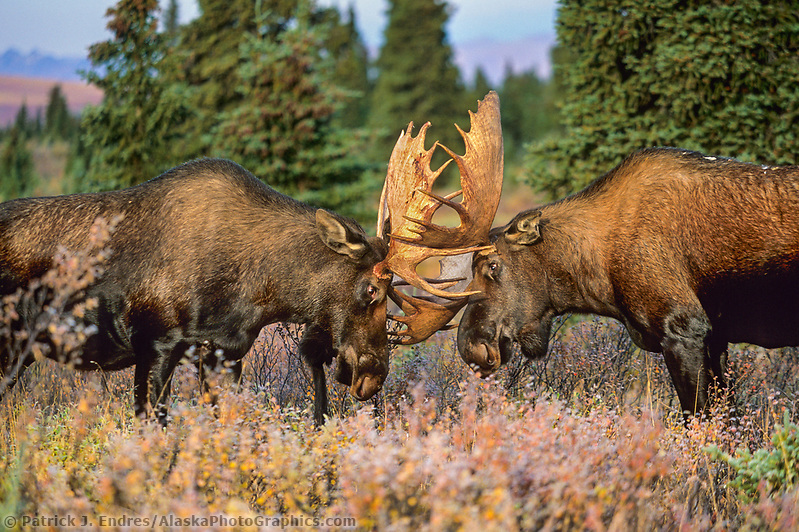 Bull moose are huge animals and become active in sparring and fighting other competing males as the breeding season begins in late August to early October. Cow moose generally give birth to twin calves in late May, but predation by wolves and bears takes a heavy toll on the calf survival rate. Wolves are rarely seen, but they plan an important role in the natural scheme. In winter, wolves generally hunt in packs. Individuals, however, can be sighted as well. Pack organization is strongest during the whelping (pupping) season in spring. 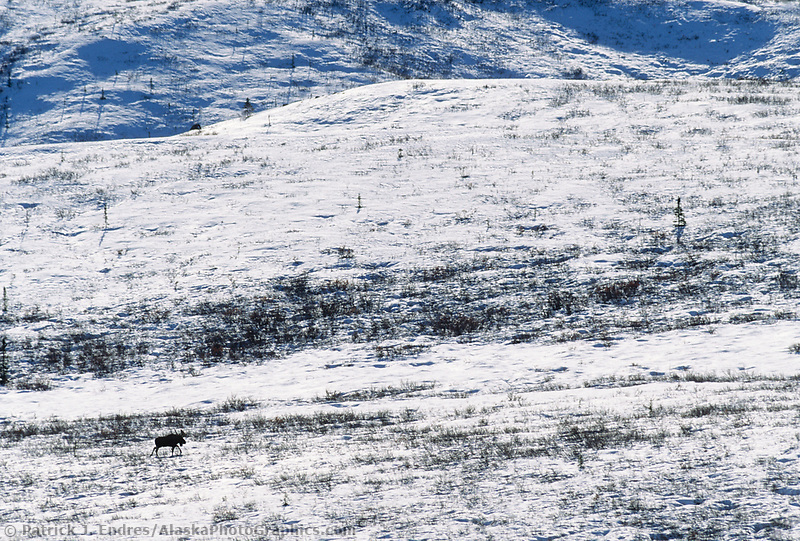 The presence of wolves in Denali is an indication of the quality of this wilderness. If you are lucky enough to see a wolf, consider it a rare and privileged experience. 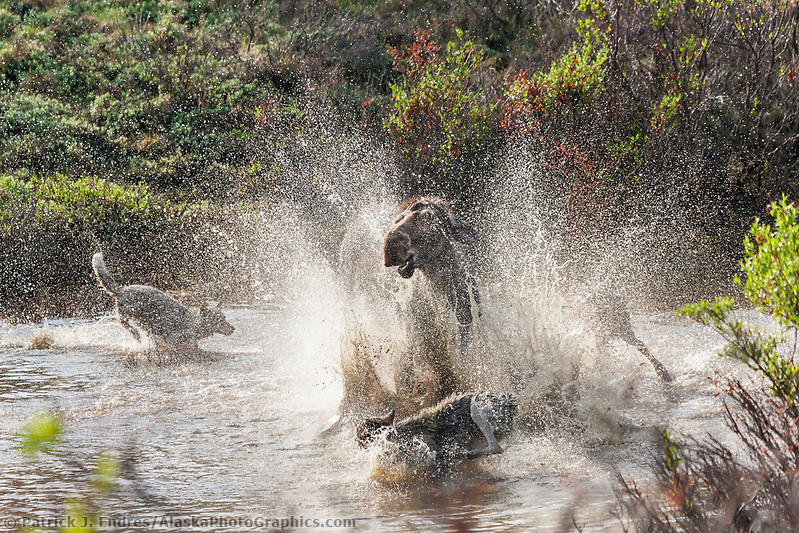 I witnessed the rather disturbing but amazing wolf and moose predation encounter and all of that sequence can be viewed in the wolf-moose predation gallery. I also wrote about this on my blog which can be viewed here. Grizzly bears are omnivores, eating small plants, berries, ground squirrels, moose or caribou calves, and occasional carrion. They are seen throughout the park. Sows generally bear two cubs, sometimes one and rarely three. They too are fiercely protective of their offspring. Wolves and grizzly bears play an important role as predators. Ever ready to take advantage of an opportunity, they cull old, newborn, and sick animals from the caribou, moose and sheep population. 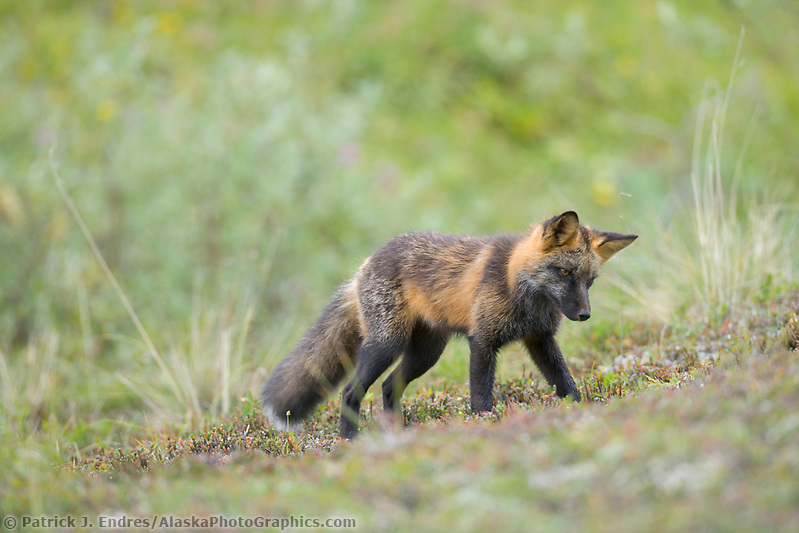 The mammals abound within the limits of this harsh, northern environment: fox, weasel, wolverine, lynx, marten, snowshoe hare, hoary marmot, red squirrel, ground squirrel, pika, porcupine, beaver, shrew, vole and the lemming. There are 37 mammal species recorded in the park and preserve. Bird life is varied and interesting. Most birds migrate long distances between their nesting grounds here in the park and their wintering areas. Wheatears winter in Africa; arctic terns in Antarctica and southern South America; jaegers take to life at sea in the southern oceans. 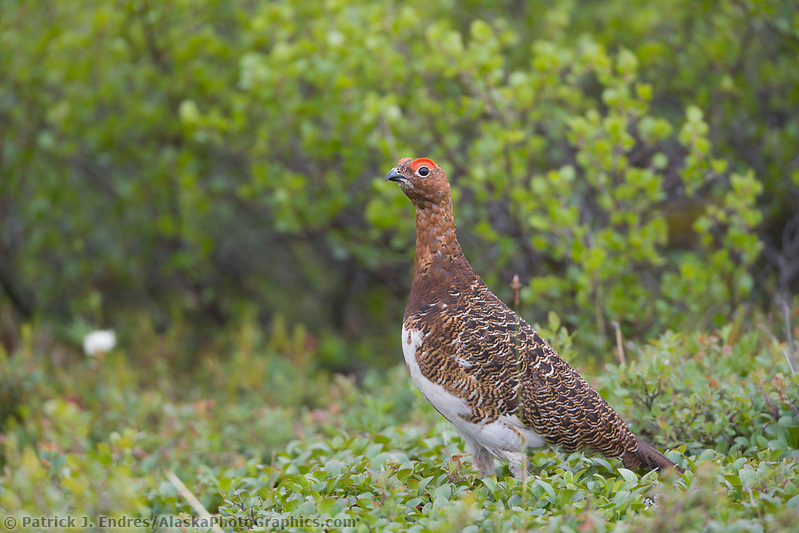 On the open tundra, you may easily see ptarmigan, Lapland longspurs, and various shorebirds. Short-eared owls and northern harriers can be seen soaring low in search of rodents. Golden eagles patrol the higher elevations and ridge tops. Raptors – birds of prey – of the spruce forest are the hawk owl and goshawk. In these forests, you may also see the spruce grouse and varied thrush. Plovers, gyrfalcons, mew gulls, and snow buntings are among the 156 species of birds recorded at Denali. Raven, ptarmigan, magpie, and gray jay are some of the species that winter in the park and preserve. Winter challenges wildlife with frigid temperatures and the cessation of plant growth. Food is scarce. Grizzlies fatten up in the summer and remain in a torpor or deep sleep most of the winter. Adult males, on the other hand, appear to enter dens later and emerge earlier than most other bears. 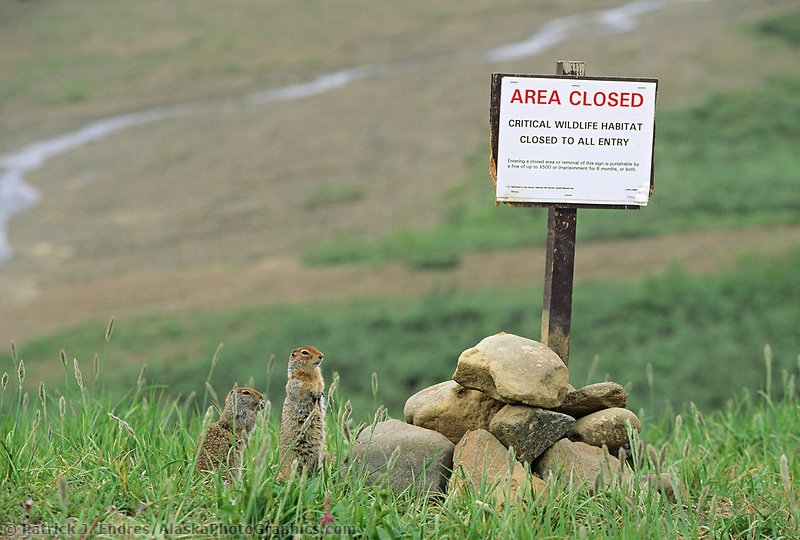 Ground squirrels and marmots hibernate, their body functions virtually halted. Beavers and red squirrels hole up and subsist on food caches. Weasels, snowshoe hare, and ptarmigan, however, turn white and continue the struggle to survive above ground against extreme conditions. Naturalist, hunter, and conservationist Charles Sheldon conceived a plan to conserve the region as a national park. Sheldon devoted much of his 1907 travels to studying boundaries for the proposed national park that would include territories suitable for a game refuge. Upon his return to the states in 1908, a campaign was launched to establish a national park. 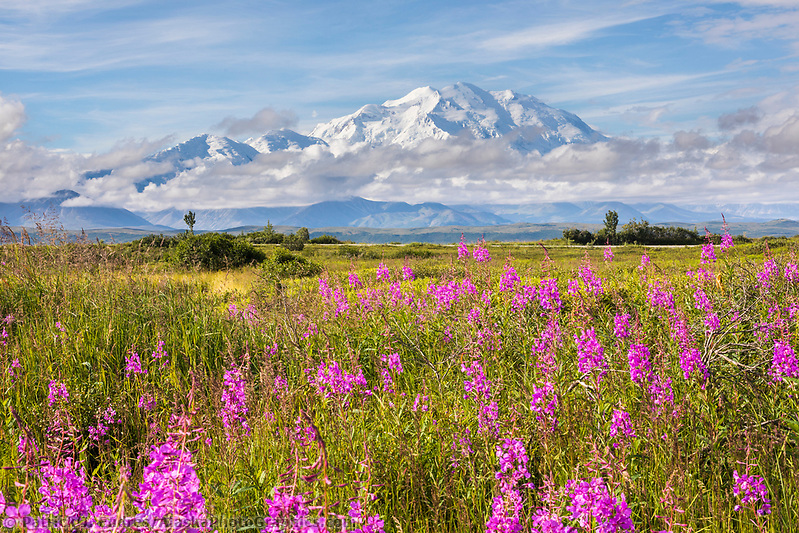 Largely due to these efforts, Mount Denali National Park was established in 1917. 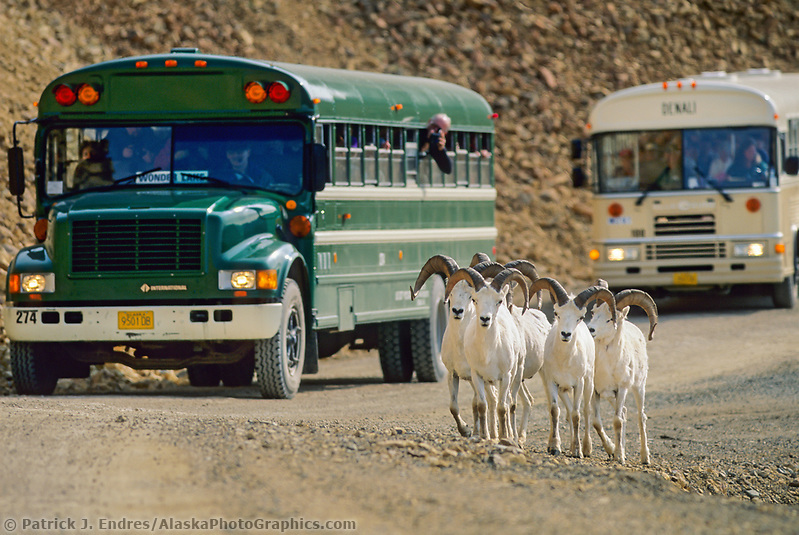 Its population of Dall sheep and other wildlife were now legislatively protected. However, Mount Denali itself was not wholly included within the boundaries. The changes in names and boundaries that have occurred over the years can be confusing. At its inception, Charles Sheldon wanted to call the park Denali, but his suggestion would not be followed until 1980. 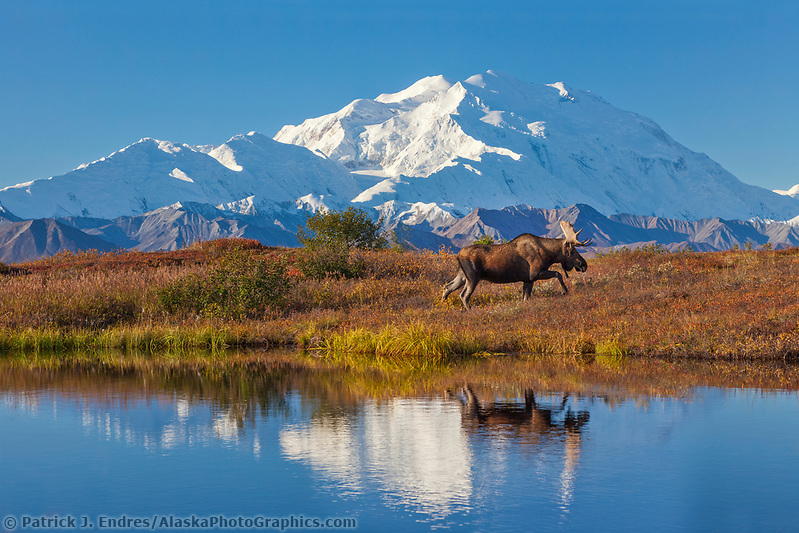 In 1917 Mount McKinley National Park was established as a wildlife refuge. The park and massif including North America’s highest peak were named for an Ohio former senator and later President – William McKinley. 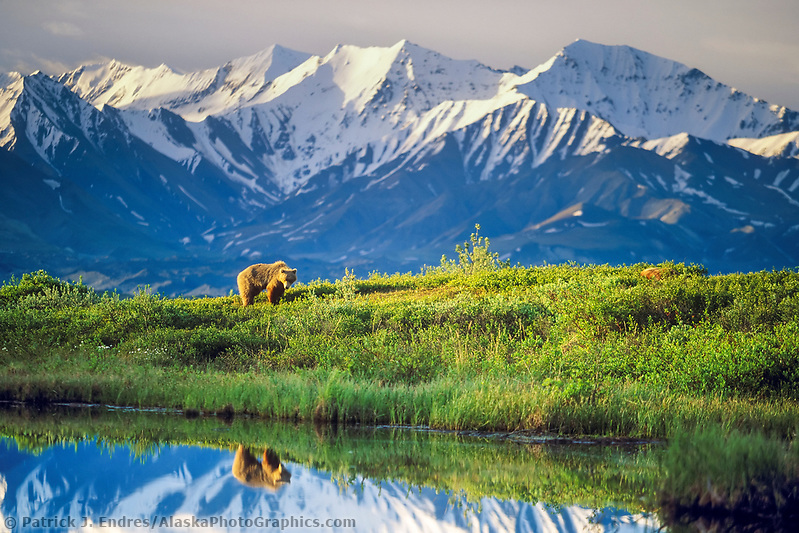 In 1980, the Alaska National Interest Lands Conservation Act (ANILCA) enlarged the boundary by 4 million acres and redesigned from Mount McKinley National Park to Denali National Park and Preserve (the mountain retained the name Mt. 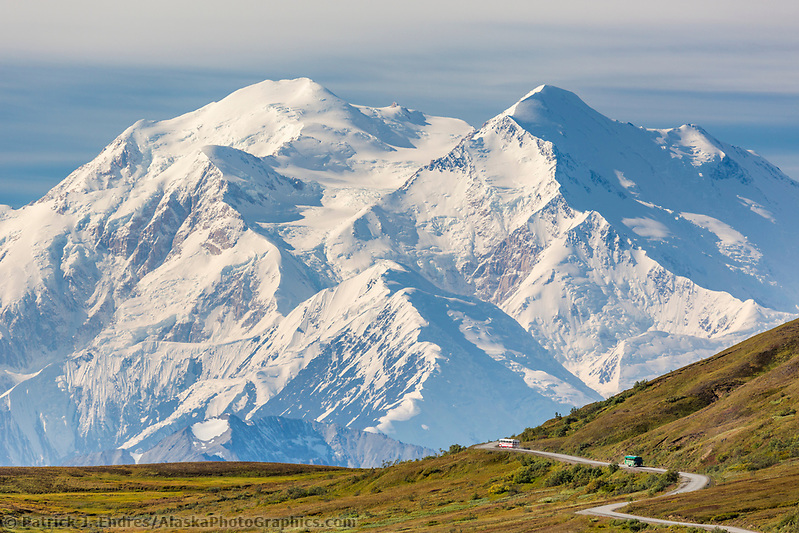 McKinley).On 02 December 1980, President Jimmy Carter signed the bill establishing Denali National Park. The park and preserve remain largely wild and unspoiled, as the Athabascans knew it. A bill submitted in January 2015 by Alaska Senator Lisa Murkowski re-proposed renaming North America’s highest peak from McKinley to Denali (already used by many local Alaskans). 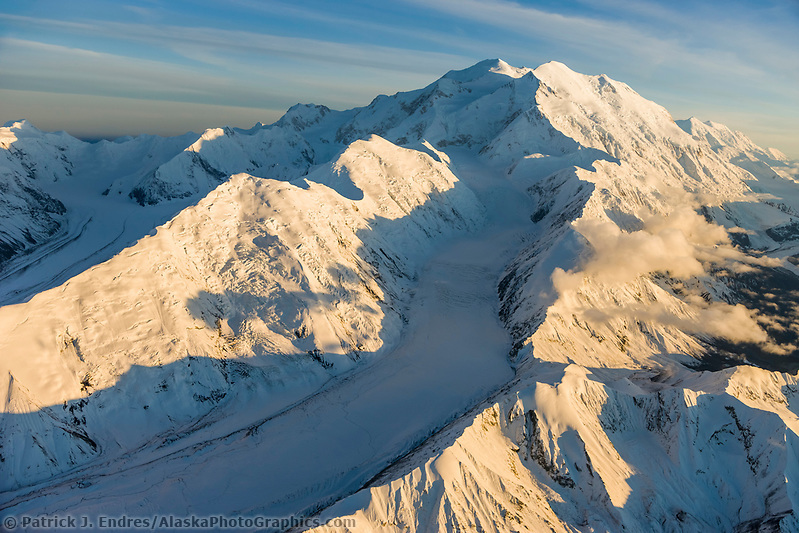 On August 30, 2015, Secretary of the Interior Sally Jewell announced that the mountain would be renamed Denali. During his 2016 presidential election campaign Donald Trump called the name change to Denali a “great insult to Ohio”, and he threatened—idiosyncratically—to revert the name back to McKinley if elected, ostensibly for political reasons.